The Rochambeau Lodge is a renovated barn with comfortable country furnishings that give it a unique and unforgettable charm. 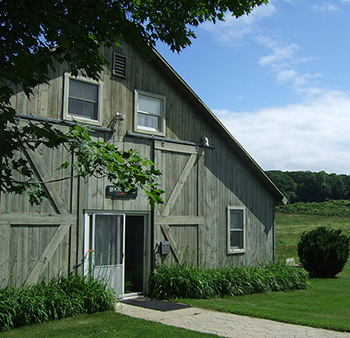 “The Lodge” overlooks the beautiful Walpole countryside and Alyson’s Orchard. Inside, you will find a fully equipped kitchen with a sturdy 12-foot table in the dining area, 2 ½ baths and eight bedrooms which comfortably sleep 16-18 guests. Rochambeau is the perfect place to stay for one-party groups such as weddings, retreats or family gatherings. Throughout the seasons, the lodge is an ideal home away from home. After a day of hiking, biking or skiing, Rochambeau provides a cozy and comfortable atmosphere. Nothing feels as good as relaxing by the wood stove after an eventful day in the cold, winter air. Or, during the warmer months, nothing beats a BBQ on the outdoor grill, a game of horseshoes and watching the sun set. Need to stay in touch with the outside world? Rochambeau is equipped with WI-FI and satellite TV. There is also a DVD player and sound system for your entertainment. Want to bring the four legged family member? We welcome up to 2 well-behaved, non-shedding dogs at $50 per dog in Rochembeau. ADDITIONAL AMENITIES - CLICK TO SHOW! If you are looking for a smaller rental for your family, check out Foster Farmhouse East. Others might prefer Foster Farmhouse West with its antique-themed decor and private baths. It’s easy to make your reservations at Alyson’s. Just fill out our online reservation form or call us at 603-756-9800. Check in 3:00 pm – Check out 10:00 am, unless otherwise arranged. "Just got back from a stay at Alysons for a family wedding. Arrived Friday night and left Sunday morning, Stayed at the lodge with 17 family members. Perfect spot for all. Great views, food and plenty to do. Ponds for swimming, fishing and hanging out. Highly recommend. Thanks Alysons!" Copyright © 2013 Alyson's Orchard Weddings. All rights reserved.